With another successful year behind us, we continue to drive our business forward and are well on the way to achieving our Strategic Goals. From the new programs and initiatives that have been created by our board and committees to the contributions of our dedicated partners and staff, our mission of supporting an engaged lifestyle after retirement through member-centred services, advocacy, communication, wellness and organizational excellence has become more of a reality. Many thanks to all the board members, committee members and staff for their valuable contributions over the past year. 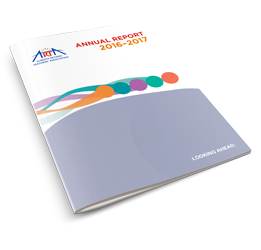 Click on the link below to download a PDF copy of the ARTA Annual Report.